The CARE Course (Comprehensive Approaches to Rural Emergencies) is an education package and community of rural emergency medicine providers. The intended audience is physicians, nurses and paramedics. RCCbc (Rural Coordination Centre of BC) has supported the development of several groundbreaking and innovative rural medical courses over the years. RhPAP is pleased to bring the CARE course to rural Alberta health professional teams of physicians, nurses (including registered nurses, nurse practitioners and licensed practical nurses) and paramedics in conjunction with RCCbc. 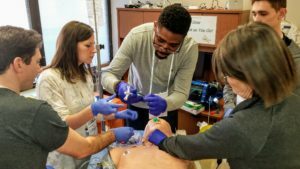 Developed by rural health care professionals, the two-day course provides interactive hands-on learning in a fun, warm and supportive inter-professional environment. Medical, trauma and obstetric emergency management are featured. The CARE Course offers practical critical procedures through hands-on learning via skill stations and high-fidelity scenarios. The focus is appropriate to the realities of rural practice and will provide attendees with the skills they need in the Emergency Department. This course is delivered to small groups of healthcare providers in their own rural facility. Want the CARE course in your community? Contact your local Rural Consultant for more information on having a CARE course in your community.